This post is sponsored by Litehouse. All thoughts and opinions are, as always, 100% my own. 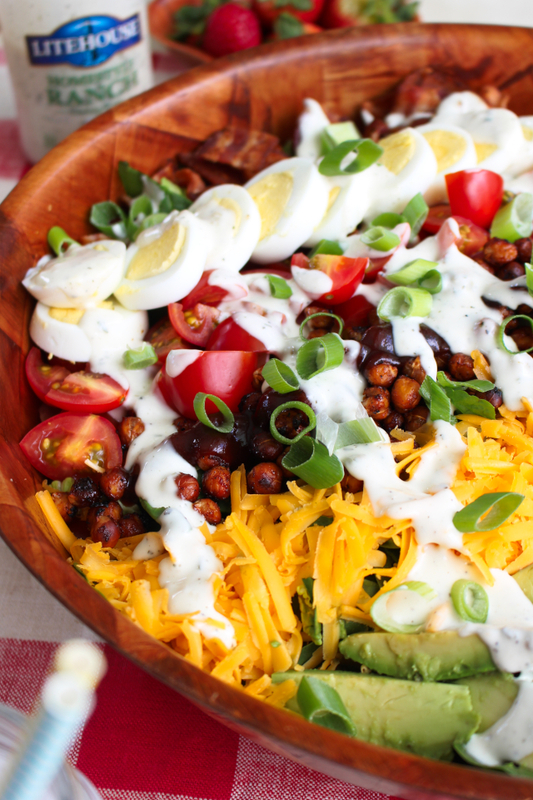 A BBQ Ranch Cobb Salad is a twist on the traditional cobb salad, topped with crisp bbq roasted chickpeas and cool, creamy Litehouse Homestyle Ranch Dressing. Spring time and summer time means time to get back outside for entertaining. Outdoor get-togethers are the best if you ask me. Who wants to be indoors when you can be basking in the sun, grilling burgers and dogs, sipping on lemonade, and serving up lots of fresh veggies and delicious fruits? Throwing a good old-fashioned barbecue is my kind of party! Spring time and summer time also means salad season, which just so happens to be perfect for showcasing summer's best produce! I love to make a nice big salad to accompany whatever I'm serving when we gather with friends and family during the warmer months. A big ol' salad will go with practically anything you're serving up, whether it be burgers, bbq chicken, or ribs. Watch out though, if you make this particular salad for your barbecue, it will likely steal the spotlight from your grillmaster. You've been warned...this salad is going to blow. you. away. Now, I'm sure you're wondering how a salad could possible take the attention away from all of that delicious grilled fare. Well, friends, the simple secret to a successful, show-stopping salad is all about what you put on it...and this salad has it all! First and foremost, nothing can make or break a salad like the salad dressing. When you take the time to make a gorgeous summer salad filled with real, fresh ingredients, you want to top it with something real, too: Litehouse dressings! Litehouse dressings are my number one choice for all of my summer salads. I'm not kidding when I tell you that these dressings are going to knock your socks off! Not only are Litehouse dressings bursting with flavor, they are sold cold in the refrigerated produce section right next to all of your fresh veggies, exactly where real dressing should be. Makes perfect sense, right? I mean, why put a room temperature dressing on your delicious, crisp, fresh salad? Cold is where it's sold! The Homestyle Ranch that is the crowning jewel of this delish salad is a combination of fresh herb and vegetable flavors. I love, love, love it. 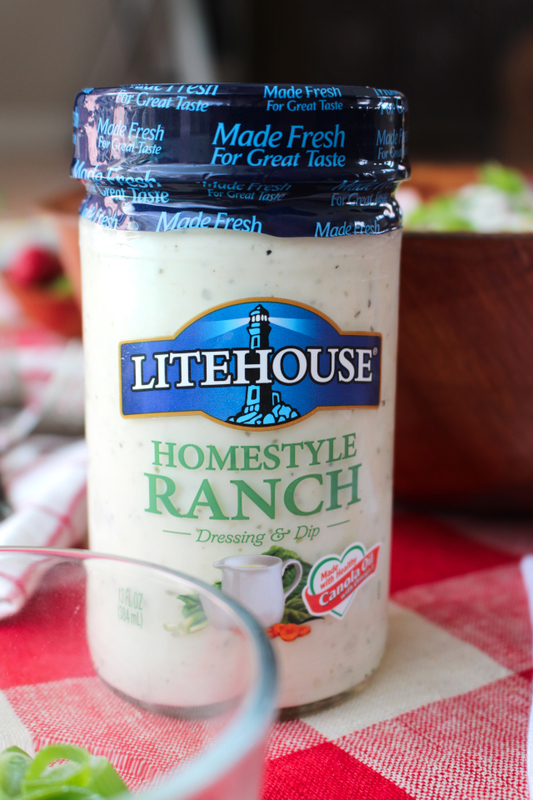 Oh, and get this, Litehouse Homestyle Ranch was recently declared the best-tasting ranch dressing by consumers during a blind sensory test against competing brands. I know you are going to love it, too! Sooo, now that you know about all about the key ingredient (the dressing! ), let's talk about what you're putting it on! 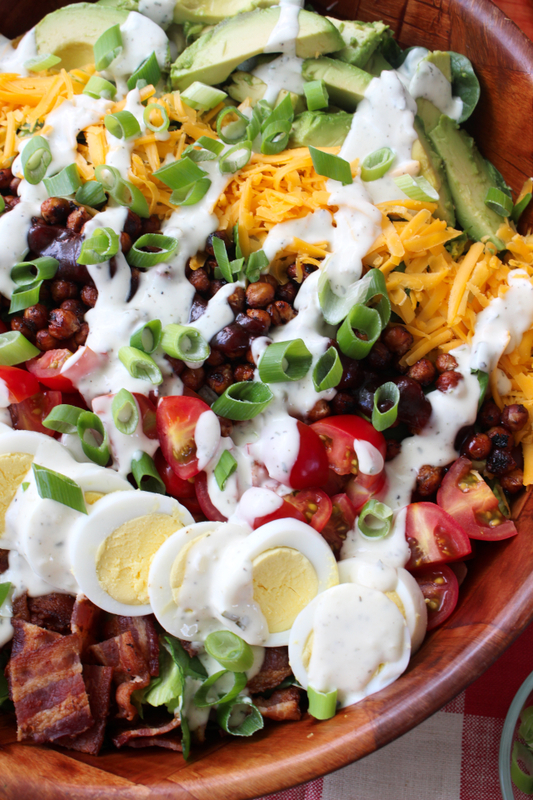 This salad is a twist on your favorite Cobb salad, only I mixed things up a bit and made it truly bbq party worthy. I swapped out the classic chicken for some crisp barbecue roasted chickpeas and the blue cheese for a nice shredded sharp cheddar, both very tasty swaps. 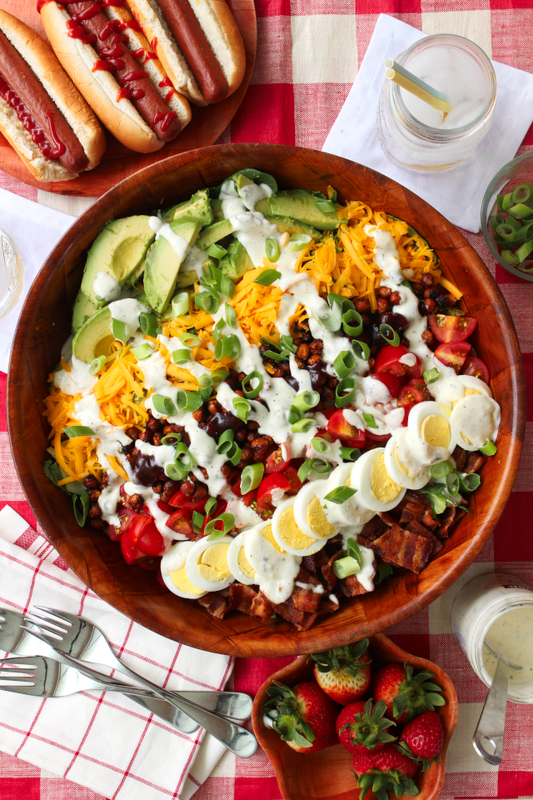 Then you've got all the traditional toppings: perfectly cooked hard-boiled eggs, crisp crumbled bacon, garden fresh tomatoes, and creamy avocado all topped with that cool, creamy Litehouse Homestyle Ranch Dressing. Now if that isn't the recipe for a killer summer salad, I don't know what is! For some sweet savings, make sure you head on over to visit my friends at Litehouse on the web where you can snag a coupon before you head to the refrigerated section of your local supermarket for your Litehouse dressings. Save some money, make a beautiful summer salad, and enjoy! Preheat your oven to 350 degrees. In a bowl, stir together the chickpeas and 1/4 cup of the barbecue sauce. Spread the chickpeas in a single layer onto a parchment lined baking sheet. Bake in the preheated oven for 35-40 minutes, stirring halfway through the cook time. Meanwhile, combine the romaine lettuce, iceburg lettuce, and spinach in a large serving bowl. 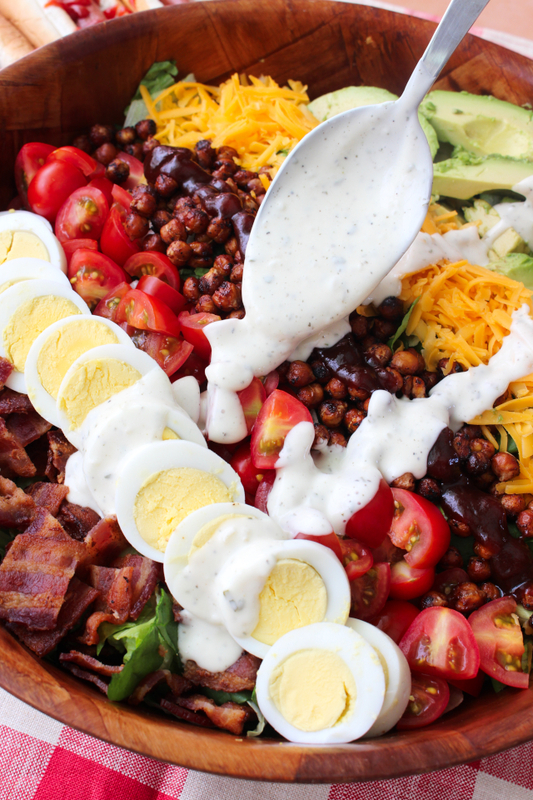 Top the salad with the cheddar cheese, hard-boiled eggs, tomatoes, and bacon. Add the roasted chickpeas to the salad and top them with the remaining barbecue sauce. Spoon the Litehouse Homestyle Ranch Dressing over the salad and garnish with the green onions. Serve with additional Litehouse Homestyle Ranch Dressing on the side.